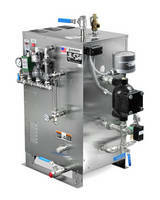 Electric Superheaters suit saturated steam applications. SSH Electric Steam Super Heaters are suitable for heating saturated steam under pressurized conditions, adding BTUs to increase quality and raise temperature of saturated steam to match process requirements. Used in industrial applications where house steam or dedicated-boiler steam is available, products are designed for freestanding and in-line superheating with ASME Code pressure vessel, ratings up to 1,000Â°F/750 psig, and Incoloy 800 Stainless Steel elements. Sussman remains the leader in the manufacture of industrial steam and hot water electric boilers for over 75 years. 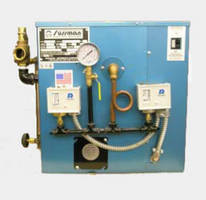 Sussman Electric boilers include a broad range of applications in all our models. HVAC, direct steam heating, hot water for process and comfort heating, humidification and air-water-oil preheating and booster heating are some of their features. Sussman is proud to feature the line of SSH Electric Steam Super Heaters, designed to your special heating requirements. The Series SSH steam superheaters are suitable for the heating of saturated steam under pressurized conditions adding BTU s to increase the quality and raise the temperature of saturated steam to match your process requirements. o ASME Code pressure vessel. National Board registered. o Standard ratings up to 1000° F/750 PSIG. o Incoloy 800 high grade Stainless Steel elements. o Flanged or NPT inlet/outlet connections. o Just set in place, connect power source and complete inlet/outlet piping. o Pre-mounted, wired and tested control panel. 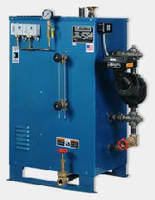 Sussman Electric boilers have been filling your steam and hot water requirements for many years. 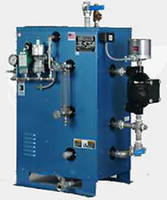 Sussman steam and hot water boilers for industrial, commercial and specialized uses. From Miniature steam generators rated 3KW - 9PPH to outputs of 5000PPH steam and 9200MBH hot water. Featuring the SSB electric steam boilers all wetted metal parts are stainless steel and passivation standard per QQ-P-35 standard. With a clean steam up to 180kW/550PPH, 100 PSIG, the SSB boiler model also features a 316/316L SS pressure vessel, all wetted metal stainless parts and provides a second low water cut off. Built to ASME Boiler Codes for Carbon and Stainless Steel constructions. Constructed to UL, CSA, NEC requirements, each boiler is fully efficient, produces no on-site products of combustion and is factory-tested, ready for use. Built & designed in USA. SUSSMAN'S experienced technical capabilities facilitate both domestic and export requirements. See our speedy request for quote form for fast service. Your specs and application requirements will be handled by our technical team for knowledgeable customer service.